Britney Simpson and Matthew Blackmer perform their Long Program at the 2013 US National Figure Skating Championships. In what has been a difficult and disappointing year, 16-year-old Brittney Simpson and her 21-year-old partner Matthew Blackmer have finally hit their stride today at the 2013 US National Figure Skating Championships. Since winning the silver medal at last year’s championships in San Jose, Calif., they have struggled to maintain the form that made them international and national contenders. 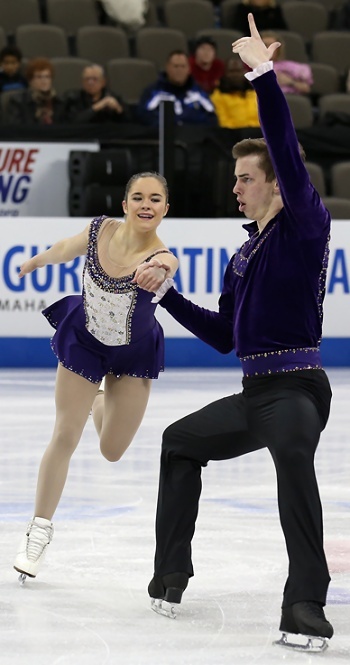 This week in Omaha, the duo has looked even better than before, finding confidence in their skating, and now wear the crown of U.S. junior pairs champions. The Colorado Springs-trained gold medalists were not perfect in their Henry V program, but they were definitely the class of the field. They opened with a gorgeous double Axel-double Axel sequence, and also executed a strong triple loop. Simpson put her hand down on a throw triple Salchow, and only earned a level one for their change foot combination spin, however, their total of 146.44 points was more than enough for the title. Moving up from third place after the short program to win the silver medals were Jessica Noelle Calalang, 17, and Zack Sidhu, 21, who train in southern California with Jenni Meno and Todd Sand. The duo was fourth in last year’s championships. “Today we skated pretty well—it wasn’t out best, but we stuck with it and had a lot of fun,” Calalang said. Calalang and Sidhu performed an entertaining program set to the music from the film The Artist. Like the champions, they also struggled with their throw triple Salchow, but they unleashed a strong throw triple Lutz at the end of their program. Their total of 141.52 points is a new personal best. The overnight leaders, Madeline Aaron, 18, and Max Settlage, 20, struggled throughout their “Carmen” program, and fell to third place with 138.41 points. “Today we didn’t do exactly what we came to do, but we’re happy to walk away with a medal,” Aaron shared. The program started out with almost too much energy, and the mistakes came immediately. Aaron fell on the first element, a throw triple Salchow, and her partner fell a few moments later on their double Axel sequence. Things did not get better on their throw triple loop—another fall by Aaron. Despite the errors, Aaron performed with poise and smiled until the end—likely the difference between third and fourth place—a slim .10 points—for the bronze medalists. “Of course in my mind, I was going to grasp onto the mistakes, but every time we run the program, we think about staying character and I put a smile on my face even if I don’t feel it,” Aaron said through tears. Last year’s novice champions, Chelsea Liu, 13, and Devin Perini, 19, held their position after the short program, and finished in pewter position. They scored total of 138.31 points. Brianna de la Mora, 14, and Taylor Wilson, 20, finished in fifth place with 120.84 points, while Jessica Pfund, 15, and AJ Reiss, 20, finished in sixth with 120.81 points.